This week has been one of the hardest while I have been here at the MTC, but also one of the most spiritual. The week started out with an incredible Sunday! We had the president of the General Primary Presidency come, Sister Wixom :) She was so sweet and shared a powerful message about the spiritual nature of missionary work. She also shared visual videos about Christ and the importance of Children in the Gospel. I really hope I get to teach a family while I am in LA! Later that night we had a fireside by the new MTC presidency. The new MTC president, President Nally replayed the announcement President Monson made in September in Conference. It reminded me of how much joy I felt in being able to serve! It truly was a day that changed my life- it was iconic, historic, an answer to my prayers, and a moment I will cherish forever! Later that night we watched a film of Elder Bednar talking to the MTC Christmas 2011. I don't know if any other talk has had as much effect on me as this one did. It was on the Character of Christ. I learned that the character of Christ focuses on others and serving, comforting, and loving them. The Character of Christ is to turn out in compassion and Love. In Christ’s pain and darkest hours he turned outward and only thought of others. I asked myself if in the middle of my own adversity could I turn outward? Elder Bednar also spoke about how a testimony will never be enough, you must be converted unto the Lord and that there is a difference. Conversion= Consistency being true to what you know to be true. We must learn to turn outward and be as Christ to truly be converted to him. When you win you turn inward- you satisfy your own needs - you focus on yourself. When you repent you turn to God. That is how true happiness is found! By turning outward as Christ does! So Wednesday we began visitor Center Training. Hna. Perez and I left our old class and joined a new one in the English speaking building. I miss my old district! I sort of became used to being the minority in the group! That’s okay it was just a funny change. It’s interesting how different Cultures create different sorts of Characters or mannerisms. 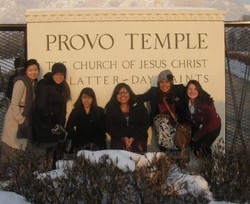 So Wednesday morning we headed to the Salt Lake Temple Visitor Center. It was an incredible experience! I am so excited to be teaching people in LA in a visitor center. I loved having the Christus and the message so focused on Christ and Families. Families truly are the greatest blessing we have on this earth and each one is unique and none are perfect. I went to class later that night and soon became a little overwhelmed... Missionaries generally have one area where they concentrate all their efforts in teaching and finding people. As visitor Center sisters we have 3. We have the Visitor Center where we teach and contact people. We stay in contact with these people or friends they suggested would like to hear about the Gospel. We also have online chatting... This may be my least favorite part. We schedule online chats with people around the world and listen, teach, and try to help. Hna. Perez and I had a not so great experience yesterday with online chatting. The man who was on was crude and mean and it made me sad that he was that way and had no hope or faith. I wish we could have helped him... It left us really discouraged, but from some advice from my Zone Leader, Elder Cordero I put it out of my mind and said a prayer. And guess what happened? I had a great experience in TRC. I am actually not sure what that stands for, but Hna.. Perez and I taught four different people each for 20 minutes as if we were in a Visitor Center. I really could feel the spirit strongly and felt as if we actually helped these individuals come closer to Christ. That is our purpose- To help people come to know their savior and experience the joys of this Gospel. I am not sure why God has called me to LA or to a Visitor Center, but yesterday I had hope that maybe I really could be a good missionary there and maybe really make a difference in at least one person’s life. I am part of the fellowship of the unashamed. The dye has been cast! The decision has been made; I am a disciple of Jesus Christ. I won't look back, let up, slow down, or be still. I'm finished and done with low living, small planning, smooth knees, colorless dreams, tainted visions, worldly talking, cheap giving, and dwarfed goals. I no longer need pre-eminence, positions, promotions, plaudits or popularity. I now live by faith, lean on His presence, walk with patience, am uplifted by prayer, and labor with power. My face is set, my gait is fast, and my goal is Heaven. My road is narrow, my way is rough, my companions are few, my guide is reliable, my mission is clear! I cannot be bought, compromised, detoured, lured away, divided or delayed. I will not flinch in the face of sacrifice, hesitate in the presence of the adversary, negotiate at the table of the enemy, ponder at the pool of popularity, or meander in the maze of mediocrity. I won't give up, shut up, or let up, until I have stayed up stored up, and paid up of the cause of Christ. I must go till He comes, give till I drop, preach till I know, and work till He stops me.